Beersheba (Be’er Sheva) is the largest city in the Negev desert of Israel. In 2005 the population reached 185,000 and Beersheba became the sixth largest city in Israel. It is often called “The Capital of the Negev”. Beersheba is divided into fourteen residential neighbourhoods in addition to the Old City. Beersheba is home to Ben-Gurion University of the Negev, and the Soroka Medical Center. Tel Be’er-Sheva, a few kilometers northeast,is where the ancient city of Beersheba can be found. 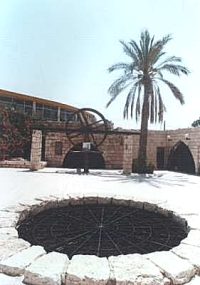 Abraham’s Well is where the first peace treaty was signed over 3700 years ago. Tel Be’er-Sheva was situated in the territory of the tribe of Simeon, in the extreme southern part of ancient Israel. According to the Torah (Genesis 21:22-31), Beersheba was the place where Abraham, father of the Israelites, dug a well as part of his covenant with King Abimelech of Gerar. Abraham also planted a tamarisk tree here, invoking the name of HaShem. Another account (Genesis 26:26-33), however, attributes the naming of the site to Isaac; it was the place where both he and his son Jacob lived. Other events are also set here (1 Samuel 8:2; 1 Kings 19:3; Amos 5:5; Nehemiah 11:27-30).